WooCommerce and Easy Digital Downloads are WordPress plugins which can be used to sell digital downloadable products and it is the common feature of these plugins.. but in case of WooCommerce plugin, it can be used to sell both digital and physical products. In case of Easy Digital Downloads (EDD) plugin, it only able to sell digital products. In term of popularity, WooCommerce is much more popular than EDD plugin and widely used more than EDD. But if you want to sell digital downloadable products then which plugin should you choose? WooCommerce and Easy Digital Downloads, both of these plugins able to let you sell your digital products. If you are in confusion then you are also among lots of others who are so confused about choosing the one which is better for them. But don’t worry, I am here to help you. Here in this article, I am going to tell you which one is better for your digital product store if you only want to sell your digital files. Here, I am not going to give the answer just in one word. I am going to give you the logical reasons which will prove that my answer was right. WooCommerce or Easy Digital Downloads? Which plugin is better to sell digital products? 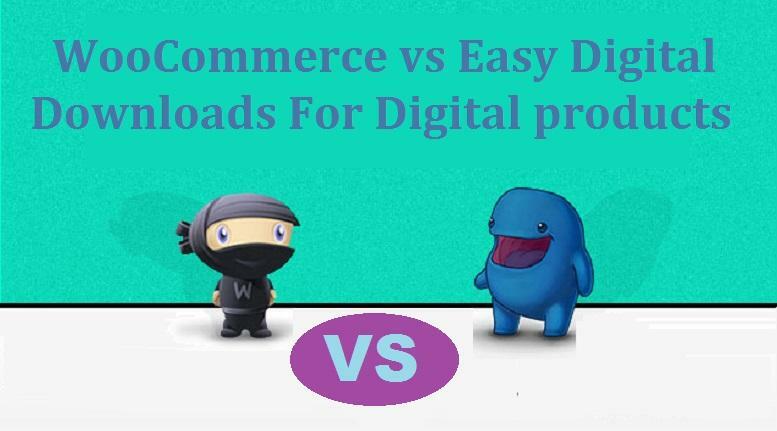 WooCommerce and Easy Digital Downloads both are able to create the digital shop. Both can help you to sell your digital products. If you want to start your digital eCommerce store then you would always like to choose the one which suits you most. I have seen many peoples say WooCommerce is the best choice for selling even if you want to sell only digital products. If you ask someone about the best plugin to sell only digital products, they answer WooCommerce and they give some reason like WooCommerce is most popular, it has all the features of eCommerce and so on. But let me say, I don’t think like those peoples. Yes, WooCommerce has all the features that a full-featured eCommerce should have and I believe it, but if you are going to start a digital product store and will sell only digital products, then do you really need all that features like shipping and selling physical products? If your store based only on digital products then there is no need to have the features in your plugin that only related to the physical products. Now here I want to give you my opinion. If your store will only sell digital downloadable products, then I suggest you choose Easy Digital Downloads WordPress plugin. Not only because it doesn’t contain unnecessary physical product selling feature like WooCommerce, but also it will increase the user experience by making the purchasing process simpler. On WooCommerce, a buyer has to go through more steps than EDD. Just think about the WooCommerce, it takes the shipping address which is not necessary for digital products. So why buyers need to provide the shipping address where it is not needed. It creates the extra unnecessary hassle to buyers which may be the reason for decreasing the interest and the buying experience. On the other hand, EDD has very simple and few steps where buyers don’t have to provide extra details. Does it make buyers tired like you see on WooCommerce? No. The Easy Digital Downloads increase the buyer’s experience and save time. Though there is the way to remove the shipping step on WooCommerce and also you can also configure it which is best for digital products. But it will be extra work to always set up and configure it as a digital product at the time of adding the product. So here also EDD wins. On EDD, it will save your time in uploading and publish your digital products and no need to mark it as a downloadable product. You should always keep in mind that specialization is always better and more powerful than generalization. WooCommerce is for selling both physical and digital downloadable products. But Digital download is made just for selling only digital products and it is specialized for digital products selling the online store. So it will be better for you to choose Easy Digital Downloads WordPress plugin. Only when you want to sell physical goods or both physical and digital goods then you choose WooCommerce and I recommend to do that at that moment. But for selling only digital products, I suggest you choose EDD plugin. Though it is better to choose the EDD over WooCommerce for selling digital products, there may be several factors taken when you have to choose WooCommerce because you don’t see any other option. I have already seen some payment gateway extension available for free of cost for WooCommerce but the same payment gateway extension plugin for EDD are not free and even it is very costly sometimes. In that case, you may think to choose WooCommerce. Also, during choosing between EDD and WooCommerce, you have to check if the payment gateway plugin you want is available or not. If it is not available for one of the eCommerce plugins, then you no, what to do. Also, you may find that you need an extension and for one plugin only the extension available and for other, it is not, then you have to make the change in decision. In these case, after choosing the WooCommerce you should check on the downloadable checkbox that you will find on the product editor page. You can see below the checkbox where you have to check it. Well, after reading the above content it is clear that it is better to choose the Easy Digital Downloads plugin over WooCommerce. Only in those situations like I have discussed on some other factors, you may choose WooCommerce. But it is only when there is no other way. So always try to use Easy Digital Downloads Plugin for your digital product selling store as it is powerful and specialize in selling digital downloadable products. EDD will help you to save time in publishing your digital products. I hope this article is helpful to you and help you to take a decision. below is the comment box where you can ask if you have any confusion. « Google AdWords vs Facebook Ads – Which One Is Better For Your Business?